Hope Thanksgiving went well for Americans. I didn’t gain weight at all, 142lbs as of Friday morning! Out of curiosity, what fiction do you read? Also, check out Dienekes post on the ability to generate disjoint clusters in the DODECAD sample set. He asserts that one may now be able to generate extreme fine-scale assessments of likely population assignment from genetic material now. 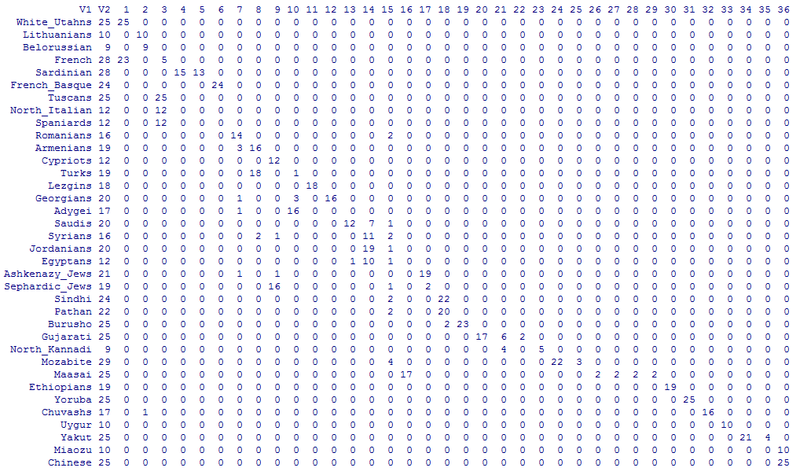 Check out this table; each column after the first two are the number of individuals in a given cluser. The rows are populations. The second column are the N individuals. Last week’s This American Life had a segment on dog feces DNA fingerprinting. I think this is a good idea. More markers, or more populations?